LAKEWOOD, NJ--(Marketwired - Sep 29, 2016) - UNEX Manufacturing, Inc., the trusted industry leader in providing innovative order picking solutions, is hosting Beer Logic while at The ASSEMBLY Show, featuring Editor-in-Chief of Assembly Magazine, John Spovieri; Vice President of Sales and Marketing, Brian C. Neuwirth; and Chad Pilbeam, marketer, public speaker and beer enthusiast who uses humor and his love for beer to lead attendees to a new and sudsy perspective on how their operations can thrive. This special event takes place, Wednesday, October 26 from 3:00 PM - 5:00 PM at conference room #8 at The ASSEMBLY Show convention center. "UNEX solutions help assembly and manufacturing facilities decrease wasteful activities, improve the ergonomics of assembly processes, and drastically improve space utilization and storage on the assembly line," said Brian C. Neuwirth, Vice President of Sales and Marketing at UNEX Manufacturing. "We want to share our knowledge and experience, along with industry thought leadership in a fun and entertaining way, which is why we are looking forward to meeting new prospects and current customers at the Beer Logic event on October 26th." With the help of a glass of Revolution Brewing's finest libations, Beer Logic attendees will discover that everything they've ever needed to know about assembly can be learned from beer. 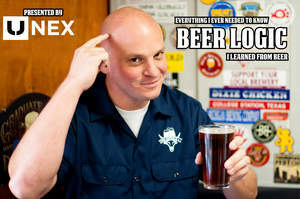 To register, visit: https://www.eventbrite.com/e/beer-logic-at-the-assembly-show-tickets-27994681847. The ASSEMBLY Show takes place in Rosemont, IL at the Donald E. Stephens Convention Center, October 25 - 27, 2016. UNEX Manufacturing will be showcasing their lineside assembly and flow cell solutions at Booth 1014. These products speed picking operations, consolidate storage on the assembly line and reduce the footprint of lineside storage. The ASSEMBLY Show provides assembly driven content, education and suppliers showcasing new techniques, products and services for the automotive and industrial manufacturing industries. Founded in 1964, UNEX is the trusted industry leader in order picking solutions that maximize space usage, increase pick rates and improve ergonomics. UNEX offers a full range of order picking solutions, including their patented carton flow solution Span-Track, a full line of gravity conveyor products tailored to the order picking process and UNEX Flow Cells for durable, modular and portable storage for the manufacturing floor. Using an extensive distribution channel, the company ensures local support is available for every customer, no matter the location, exceeding customer expectations through continuous improvement, customer service and empowered employees. UNEX is an ISO-certified company committed to quality and bringing value to customers in the wine & spirits distribution, food & beverage, retail and manufacturing industries. For more information, visit: www.unex.com. About this company UNEX Manufacturing, Inc.